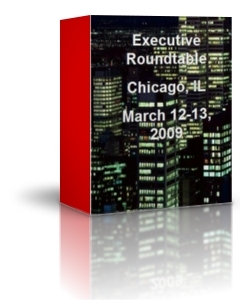 You are cordially invited to participate in an Executive Roundtable with other non-competitive peers. As a program participant you will help set the agenda for our the next Roundtable program. I am asking each participant to provide a general classification for the issue and brief description of the specific issue you want to discuss. By providing a general classification for your issue, it will allow us to prioritize them. "It's interesting to hear your peers talk about sales and marketing issues that are very similar to those you are dealing with. The only difference is these people are from different industries. The issues are universal, however, the various management styles in dealing with the issues is what made this roundtable session so productive and enjoyable." "A very productive mix of people and industries. Good, useful insights! I learned things that I started to apply my first day back!" WHO SHOULD ATTEND? Company owners, CEO’s, Presidents, Vice-Presidents, Top-Level Managers. 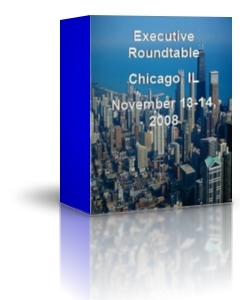 The Executive Roundtable will be limited to 6-8 participants. The investment for the program is $995 per participant and will be held in Chicago, IL at a convenient location. Each participant will be responsible for his or her individual travel and meal expenses. Chicago, IL November 13-14, 2008 SOLD_OUT! Columbus, OH November 20-21, 2008 SOLD-OUT! You may register for the Roundtable by calling 1-800-655-0422 or register online by clicking the Roundtable Registration Links above.